Apple + Maps needn’t = a crappy holiday gift. This blog has something of a history of being slightly cynical about map-shaped things. Or at least reporting them in a cynical way. If anybody DID want to send us a skillet in the shape of Texas it would not be returned to sender. One of the craftiest members of our team (and by that I mean artistic crafty) has been customizing iphones using old maps and we have to say the results are wonderful. The process is simple and looks equally good whether you are using maps of South Africa or San Francisco. Indeed, if you are seeking a gift for your favorite couple you could even refer back to one of our recent stories using maps from Scotland and the American North West and wish them a Dull and Boring Christmas from the bottom of your heart. Get the full story – including a detailed ‘how-to’ in the following video. This article by Eric Wilder from our Local, National and International Travel Desk. Have you ever scored tickets to the big game in the city over the weekend and been stuck without a car? Ever wanted to fly back home for the weekend to visit the ‘rents, rather than battle through traffic or miss the train? Ever needed to hop on a quick flight upstate to help your brother move out? Sometimes, catching that 1-hour nonstop flight is no problem. Other times, you may want to bring your collection of USA Lonely Planet Travel Guides to kill time with some joy reading. We researched 5 ways you can fly to a final destination that is less than 100 miles away and end up seeing much, much more of the country than you bargained for. How did we do it? We picked a hypothetical travel day at random and went search-happy on various air travel booking websites to find some of the more absurd connections you could make on your next flight! Live in Manhattan and need to catch a business meeting at your company’s satellite office in Hartford, CT, but don’t own a car and can’t use public transportation to get there? If you need to fly, you could book a flight that departs from NYC, touches down in Orlando and Atlanta, and finally, makes its way over to Hartford. 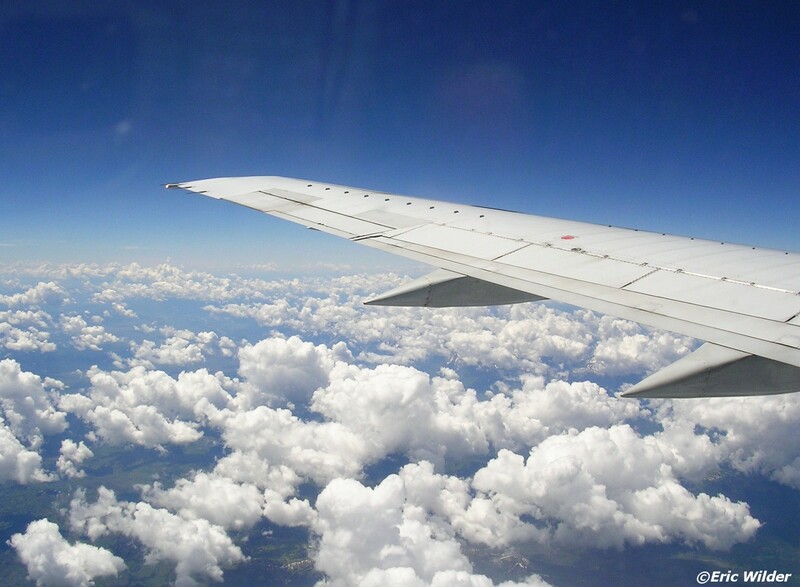 What if there are no nonstop flights to your destination? Take this one, for example: if you live in Ontario, CA and need to fly into LAX, you could get a flight that has layovers in Dallas and Chicago, en route to your Los Angeles destination. Sure, the Ontario and LAX airports may only be 57.1 miles apart in driving distance, but anything is fair game in air travel. Trying to get from Daytona Beach to Orlando, FL? If time is a concern, we recommend that you avoid booking the flight with the layover in Atlanta, followed by the layover in Washington, DC, followed by the layover in Detroit. That’s a whopping 14 hour, 45 minute flight itinerary when all is said and done. “Hurry, only 200 left at this price”. Madison to Milwaukee, WI? Hope you enjoy Dallas-Fort Worth Airport and Denver International Airport. San Jose to San Francisco, CA? Better plan to pick up lunch in Salt Lake City and take a cat nap in San Diego. 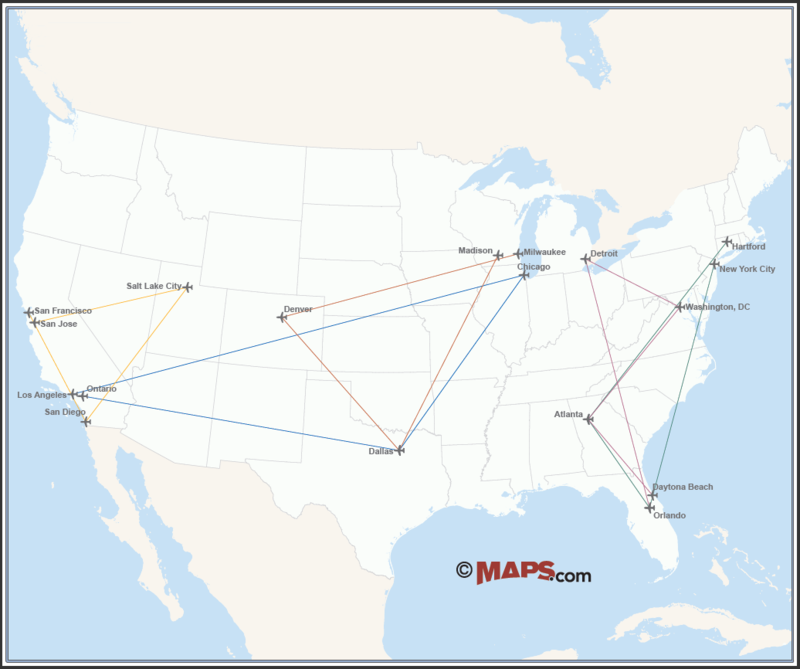 Which of our routes gets you traveling the greatest distance, you ask? The Ontario to Los Angeles itinerary comes in victorious, traversing nearly 4,000 miles of American air. Being that we all enjoy a good map, we of course had to plot these routes. Below is a map that displays the simple straight-line distance of each of these ludicrous flight paths, for your cartographic viewing pleasure. More bang for your buck? More airline miles? More crying babies? Maybe, but one thing is for sure – if you are a crazy cartography geek and travel lover, there is no better way to fly the United States and end 100 miles from where you started. Eric contributes regularly to Maps.com’s social media output. If you have suggestions, comments or ideas for new articles, or you have some of your own ridiculous travel itineraries, let us know in the comments. Eric will have plenty of time to read them during his daily commute, from Santa Barbara to Goleta, by cruise liner, stopping at Puerto Vallarta, Mexico, en route. Get quickly from A to B. Via F, D, R, S and Y.
Mittengate: When neighboring states fall out over lines on a map. Wisconsin and Michigan are said to be taking steps to secure their borders today as the ‘Mitten Wars’ bring relations between the neighboring states to an all time low. If total superiority in NFL Football wasnt enough, the state of Wisconsin has taken the agressive step of declaring itself ‘The Mitten State’ for a new winter campaign. This is based on Wisconsin’s borders resembling a left-handed mitten when plotted on a map. This caused uproar in neighboring Michigan which has long regarded itself as the primary Mitten state seeing as its outline as resembles a pair of mittens, one pointing vertically up and one meeting it at fingertips horizontally. Or any other way you wish to interpret it. After calling an emergency ‘Super Committee’ together here at Maps.com to review and agree official policy, we wondered if Michigan didn’t appear to be more like a Sasquatch looking up at a basking shark with an open mouth, whilst Wisconsin more closely resembled a hastily stuffed purse. However, when passing both maps through our geocoding analyzer using the ‘best fit’ algorithm (developed by our in-house programmers for use in such boundary disputes) we decided that there was no dispute after all. Despite the outrage expressed by some parties in Michigan, the data clearly shows that Wisconsin has a single mitten, for which it can be proud, and that Michigan ‘The state’ actually applauds the notion. (See algorithmic graphical outputs below). If you can offer further analysis please do not hesitate to comment in the box provided, or at least take our poll. No, U.S. diplomats haven’t returned to Iran to face the mob that overran the British Embassy last week. No feet are required on the ground for this first-ever virtual embassy launched by the U.S. State Department as part of its friend-making campaign towards the Iranian people. The relationship between the U.S. and Iran has been made more tense of late by the Iranian administrations continued attempts to develop nuclear material and the recent crash of a CIA drone in Iranian territory. The Iranian government will likely attempt to block the site from networks within the country, as they have for many site they deem inappropriate or counter to their own message. At the time of the announcement, the site had been operating for several hours with no attacks or blockage. Should it happen, the U.S. will do whatever it can to reset access and is confident that they can keep it up and accessible. This does not signal a change in the diplomatic relationship, or lack thereof, between the two countries, but a new tactic to reach directly to the Iranian people. Area: 1.6 million sq. km. (636,295 sq. mi., slightly larger than Alaska). Arable land: 9.78% of the country. Cities: Capital–Tehran. Other cities–Isfahan, Tabriz, Mashhad, Shiraz, Yazd, Qom. Climate: Semiarid; subtropical along the Caspian coast. Population (July 2010 est. ): 76,923,300 million. Population growth rate (July 2010): 0. 1.253%%. Religions: Shi’a Muslim 89%; Sunni Muslim 9%; Zoroastrian, Jewish, Christian, and Baha’i 2%. Education: Literacy (total population age 15 and over who can read and write, 2003)–79% (male: 86%, female: 73%). Health (2010 est. ): Infant mortality rate— 43.45 deaths/1,000 live births. Life expectancy at birth (2010)–total population: 69.77yrs. Constitution: Ratified in December 1979, revised 1989. Branches: Executive–Supreme Leader (head of state), President (head of government), Council of Ministers, Assembly of Experts, Expediency Council, Council of Guardians.Legislative–290-member Majles (National Assembly, or Islamic Consultative Assembly).Judicial–Supreme Judiciary. Suffrage: Universal suffrage; 18 years of age. Matthew Cusick’s art has a hidden side. 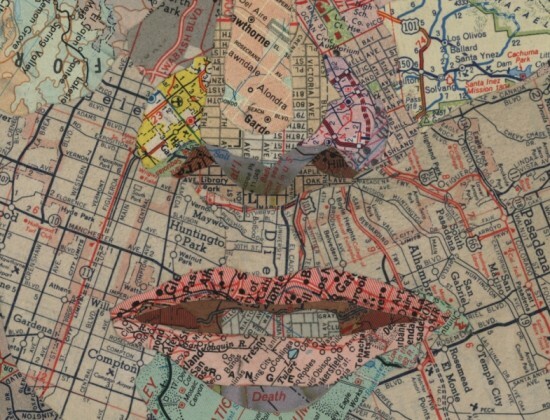 Get close up and you will see that he has created these wonderful collages from recycled maps. Using topography, street lines, shading and borders he creates meticulously detailed works that make stunning viewing. The subject matter varies, from horses, to waves and freeway interchanges. A graduate of The Cooper Union for the Advancement of Science & Art, Matthew resides in Dallas, TX. His work has shown across the world including numerous exhibition in his birthplace, New York City. He gave this interview to Alice’s Blog at My Modern Met in March of 2011. What got you into creating portraits and landscapes with maps? About nine years ago, frustrated with paint and brushes, I just started experimenting with some maps I had laying around the studio. I found that maps have all the properties of a brushstroke: nuance, density, line, movement, and color. Their palette is deliberate and symbolic, acting as a cognitive mechanism to help us internalize the external. And furthermore, since each map fragment is an index of a specific place and time, I could combine fragments from different maps and construct geographical timelines within my paintings. Maps provided so much potential, so many layers. I put away my brushes and decided to see where the maps would take me. I think collage is a medium perfectly suited to the complexities of our time. It speaks to a society that is over-saturated with disparate visual information. It attempts to put order to the clutter and to make something permanent from the waste of the temporary. A collage is also a time capsule; it preserves the ephemera of the past. It reconstitutes things that have been discarded. A collage must rely on a kind of alchemy; it must combine ordinary elements into something extraordinary. How long does one piece take? It is hard to say exactly. I never keep track of the hours. I’ll work on a piece for two or three weeks and then put it aside and start a new one. To really understand what is going on in one piece I need to be working on another. I’ll usually have at least two or three in rotation. I just finished a sixteen-foot wave commission that I’ve been working on for a year. Normally, a four-by-six foot piece takes about three months to complete. The smaller ones can take three to six weeks. The portraits are the most difficult, no matter what size. Sometimes I scrape off all the maps and start over again, and some subjects I work and re-work for years. How much paint do you use on top of the maps? I never paint on the maps. I let the maps be themselves and they establish the palette for me. Sometimes there will be an underpainting that is revealed when I scrape off maps that aren’t working. These areas are never planned though, just happy accidents. I do often paint the sky of a composition a single flat color. If I need to manipulate the values of the maps in order to achieve richer darks, I use ink, mostly walnut ink that I make myself. This way I am not really adding a new medium to the map, only increasing one that is already there—the ink. What’s your creative process like? What dictates who or what you’ll create next? I am always thinking about new creations. Usually my best ideas come to me as I’m working on something else or just keeping busy in the studio. Whenever they come I jot them down in a notebook. Then, when I am ready to start something new I look through these notebooks. There are deadlines, and commissions, and sometimes these can lead to your best work as well, but my creative process is very unpredictable. I typically don’t commit myself to anything but the few pieces that have made it from my notebook to hanging in my studio as works in progress. The next pieces are determined by the outcome of the ones that proceeded them. How has the internet helped you with your career? My work has traveled very little outside of the United States. The internet has enabled people from all over the world to see my work. Yet they are still only seeing the digital reproductions. Even so, it is a wonderful thing to know that the work is being seen and admired globally. what next for the middle east? With the current happenings throughout the middle east region, cartographers everywhere are watching with interest, trying to work out how they could fit ‘Peoples Republic of Bahrain‘ onto a country less than one third the size of Rhode Island. Following successful coups in Tunisia and Egypt, notable demonstrations have taken place in Yemen, Iran, Bahrain, Libya and Algeria as the people increasingly sense that they can make a difference. In spite of the almost shining example which led to the resignation of Hosni Mabarak, other regimes have chosen to meet the resistance with violence. The ripple effect is being felt first and foremost in oil prices. Already the cost at the pump is rising steeply, as oil prices surge past $100 per barrel. Tourism has been severely affected, with carriers to the region seeing falling passenger numbers, and hotel occupancy rates in normally popular destinations significantly down (except for those filled with journalists of course). Meanwhile much of the focus of the US government, already heavily immersed in a domestic financial crisis of its own, has been diverted to these events, offering verbal support for ‘non-violent’ routes to democracy whilst ensuring that regimes who have protected US interests for long periods are not alienated in the event that they should prevail. Analysts trying to anticipate possible shock waves are trying to predict where trouble might flare next, and the possible outcomes. Many of the world’s banks, who have significant interests in the Middle East, have had their own researchers provide reports on possible outcomes using available data. This helps to give a snapshot of where significant change could occur. Unsurprisingly, Libya leads the group, with high unemployment and more than 40 years of dictatorship. As the world’s 12th largest oil producer, instability here is of serious concern to western nations including the United States. Bahrain boasts a Sunni Royal Family overseeing a mostly Shiite population, and this inherent tension was severely exacerbated after police opened fire on a previously peaceful protest, while Yemen is almost the perfect storm when it comes to potential trouble – corruption, poverty, unemployment, water shortages and an activist Shiite population could see violence levels rise further. Deutsche Bank offers a full report on 10 potential hotspots reproduced here by Kathy Lien in her Forex Blog.